Important: These are not directions for making this yourself. These are the instructions that came with this trick that sold for $89.00 and included the civil war book: The Road To Gettysburg. These directions are geared ONLY for that book. This PDF is designed for collectors who may have the props, but no directions, magic historians, and those simply curious as to how this trick was done. 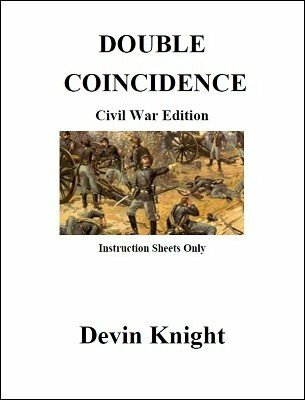 If you want to make this up using any book then check out this PDF: Double Coincidence . Mentalist tells the audience that before the show, he gave a lady a dictionary, a red crayon and an envelope. He asked her to secretly circle a word and to seal the dictionary in the envelope. She was instructed to tell nobody the word, nor let anyone tamper with the envelope. He says this envelope is still in the audience. When it's time to perform this effect, the Mentalist calls two people on stage. The sealed envelope with dictionary is then retrieved by one of the spectators who holds on to it in full view. The Mentalist picks up a 300 page book and turning his head away, riffles the pages to have one spectator select a page from it. The book is opened at that place and given to spectator. It's obvious to the audience that the Mentalist hasn't had a chance to glimpse the pages of the open book. NO PAGE NUMBER IS CALLED OUT AT ANY TIME. With his back still turned, the Mentalist asks the spectator to silently read the first few lines on the left page. Immediately, with no fishing, the performer describes what the person just read. This is pretty amazing, but the Mentalist is ready for more, much more. He asks the person to read the first sentence on the right page. He tells the person to choose any object from the sentence and form a picture of it in his mind. The person has more than one choice of objects he could think of. The Mentalist proceeds to accurately describe the object the person is thinking of. He even gives a description of it (the same image the person has in their mind) even though no description may exist in the book. Again he does this with NO FISHING. The spectator is asked what he was thinking of and it is seen the performer was 100% correct. Now, for the big finale. The spectator is asked to call out any word on that line. The sealed envelope is opened and the other spectator (not the performer) removes the dictionary. There is note stuck on the dictionary; that note tells which page number has the circled word on it. The spectator opens the dictionary to that page (and yes, he can riffle the dictionary to check that this is the only circled page) and shows the audience the circled word. Before the word is read aloud, the Mentalist states wouldn't it be a marvelous coincidence if the only circled word on the dictionary was the word just called out by the first person. The word is read and seen to be the same word just called out! An unbelievable coincidence. 1st edition 2016, 30 pages.